Engine: The modern and compact engine features the latest in 2-stroke technology offering class leading performance and ride-ability. By using a 3-shaft design, the crankshaft is positioned near the center of gravity which not only benefits mass centralization but also creates the ideal intake angle into the reed valve delivering top level performance. Additionally, a power reduction kit is available from Husqvarna accessories which limits the TC 50 to 5.5hp for first timers and complete beginners. Cylinder: The high performance cylinder is made from lightweight and durable aluminum and incorporates a pressure controlled exhaust valve (PCEV) which provides unrivalled performance within the highly competitive 50cc class. Handlebars: Made of high quality aluminum alloy, the handlebars offer top stability and safety. A crash pad on the handlebar brace protects the rider from any impact. Wheels: Mirroring the full size motocross range, the TC 50 uses lightweight, black anodized, aluminum rims providing the highest strength and reliability. The standard MAXXIS tires provide progressive grip on a variety of different terrain. 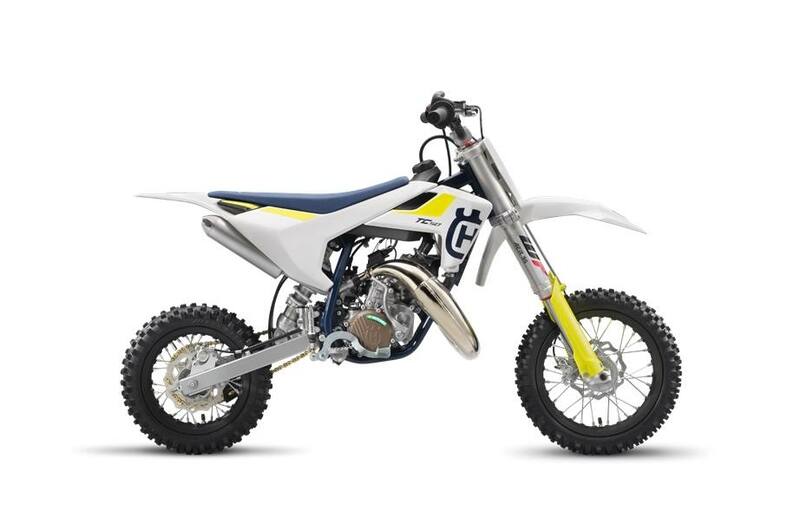 Brakes: Featuring the same level of technology offered on the full-size motocross range, the TC 50 is fitted with hydraulically operated brake calipers and waved front and rear brake discs. The system ensures advanced brake feeling and stopping performance in all conditions.